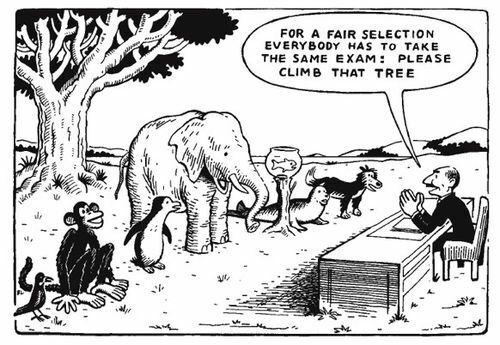 As the cartoon suggests: different types of assessment are really the best way to truly assess someone's capabilities. It is important to look at WHAT needs to be assessed, and build your assessment based off of that. Maybe the multiple choice format isn't the most appropriate for every situation. My research paper talks about the use of collaborative learning activities, in the form of inquiry based lab assignments, as formative assessments. You may find it applicable. When making an assessment, summative or formative, it is usefull to explicitly identify which learning objectives you are assessing. Use the list you made in step one. After identifying which learning objectives you wish to assess, be sure to fill that information in on your Unit Plan. Purpose: Generally speaking, a summative assessment is used to determine the SUM of the student's knowledge and ability. Traditionally this is in the form of a Unit Test. Of course, it does not need to test the students' ability on every single learning objective. Most summative assessments don't, in fact. They test a few, the most foundational, learning objectives. If you need to test more than that, you may want to consider using MULTIPLE summative assessments. For instance, maybe you have a unit test and a final presentation. Although there is some overlap in what knowledge and skills are demonstrated in those activities, the main purpose of each assessment is different. Between the two assessments, all of the most important learning objectives are assessed. 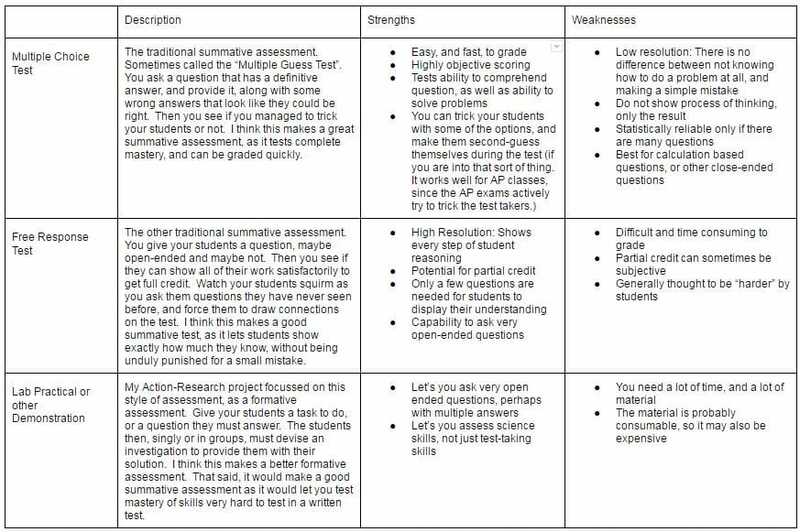 Summative assessments can also be placed at the end of each "chunk", or piece of your unit, to test your student's level of mastery before moving on. Purpose: Traditionally thought of as just quizzes, formative assessments are most effective when used as a regular check-in. They aren't effective when given when you will be moving on to new content, regardless of the outcome. Instead, the are most effective when used to determine how much your students know, and help you plan what you will be doing next. If you are moving on to new content next week, your end of the week quiz is not formative. In that case it is a mini-summative assessment. An end of the week quiz that identifies which skills and knowledge our students are still struggling with is a formative assessment. It is particulary effective when the results of the assessment are used to plan what lessons you will do next. They let you modify your Unit Plan on the fly, rather than moving forward regardless of student mastery. (And then being shocked by the test scores at the end!) Formative assessments can be just about anything, and can be given almost constantly. They don't even need to be graded if you don't want to grade them. The point isn't to give you something to put in the gradebook, but to see how your students are doing. Questions I have already typed in are asked of a random student or group. If they answer correctly, they do damage to the Boss, with the possibility of doing double damage (called a Critical Hit). If they answer incorrectly, the Boss does that damage to them, with the possibility of doing double damage. Teammates can use special powers they have earned to help if a question is answered wrong. Grading with a rubric can seem a little...arbitrary at times. 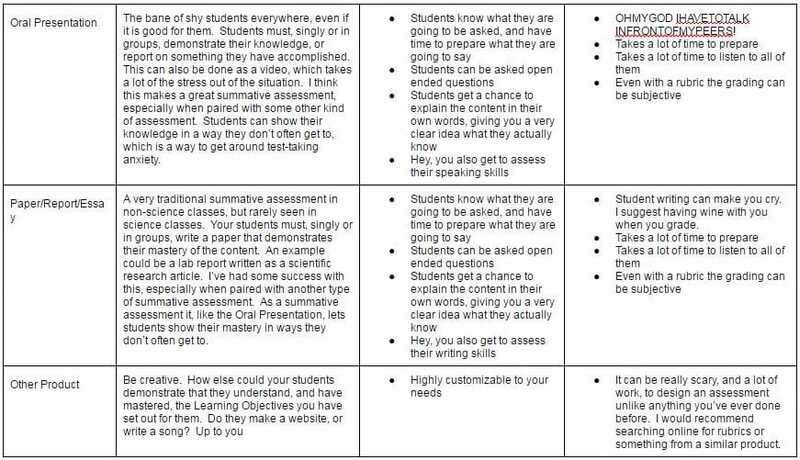 The trick is to make a good specific rubric and add the objectivitiy you need in order to fairly and quickly grade your students' work. 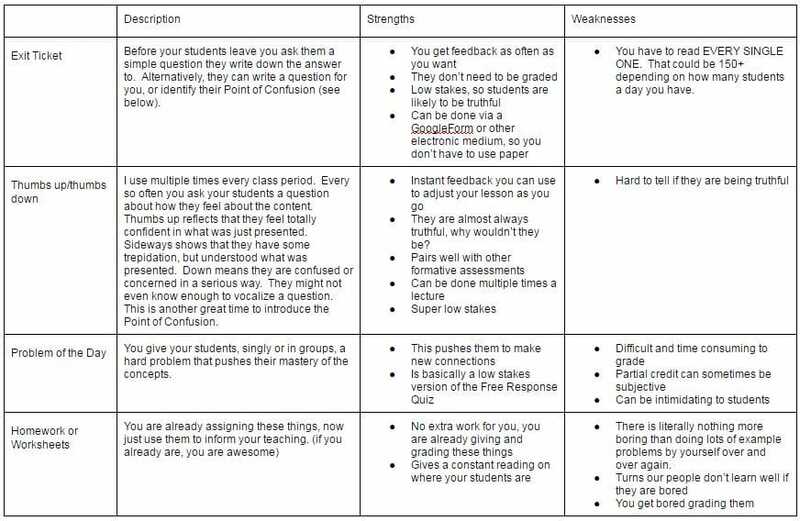 I like to have a general rubric that I use for all similar activities, which I then customize to make it specific to my need. For instance, say you are grading an oral presentation. Maybe in addition to "line of reasoning is clear and easy to follow" you want to add some language to the effect of "each piece of evidence is presented, and its connection to the hypothesis is clearly stated." Maybe you want to be even more specific: "5 pieces of evidence are presented and their connections to the hypothesis are clearly stated." I am a firm believer of the "less is more" principal. You do not need to grade every aspect of a product, or every skill that went into making it. 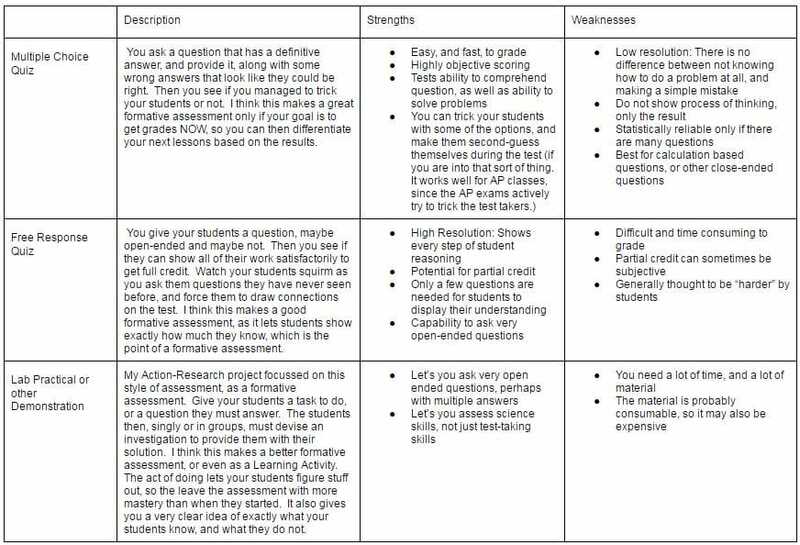 Your rubric should only have the most important objectives in it, and it should all fit on one page. If it is more than one page long, it is too much information for one activity. Be sure to write your rubrics at an appropriate reading level for your students. CHUNKING YOUR UNIT - Here, you will divide your learning objectives into "chunks". Each chunk will have learning objectives that are taught, and skills that are developed. Formative assessments can go in the middle of a chunk, or at the end. Traditionally each "chunk" ends with a quiz. After chunking, you'll actually come BACK to this page to finish choosing all of your assessments. LEARNING ACTIVITIES - Once you've designed your final summative assessment, chunked your unit, and then designed the rest of your formative and summative assessments, you are ready to move on. By choosing your learning activities you will determine HOW your learning objectives will be taught, and developed.